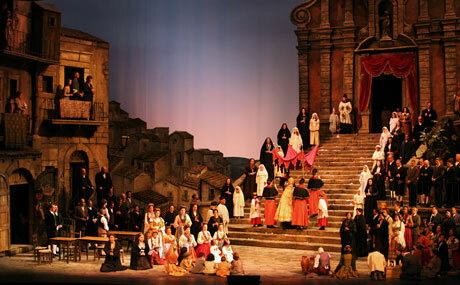 Cavalleria rusticana is an opera in one act by Pietro Mascagni to an Italian libretto by Giovanni Targioni-Tozzetti and Guido Menasci, adapted from a play and short story written by Giovanni Verga. Cast: SANTUZZA, a peasant girl (soprano or mezzo-soprano) TURIDDU, a young peasant (tenor) LUCIA, his mother (contralto) ALFIO, a carter (baritone) LOLA, his wife (mezzo-soprano) CHORUS: villagers Place: A village in Sicily Time: About 1880, on Easter Sunday Prelude Siciliana TURIDDU behind the curtain O Lola, white and red as the cherry In your nightdress white as milk, When you appear at the window you smile; Happy he who gave you your first kiss! The mark of blood is over your door, But I care not if I am killed; If through you I die and go to Paradise, It will not be Paradise for me unless you are there. Ah! ONE AND ONLY ACT A square in the village. In the background right, a church with a door. On the left, the inn and Mother Lucia's house. At first the stage is empty. Dawn is breaking. Introductory Chorus Chorus CHORUS from within Ah! WOMEN from within The orange trees lilt he green groves Scent the air, The larks sing Through the flowering myrtles; Now is the time For everyone to murmur The tender song Which quickens the heart. The women enter. MEN from within Across the fields Amid the golden corn The sound of your shuttles Reaches us In our fatigue. Lightening our labour. We think of you, Sweet rays of sunshine. We hasten to you As a bird flies To his mate's call. The men enter. WOMEN Now cease Your rustic tasks; The blessed *** is gladdened By the Saviour; Now is the time For everyone to murmur The tender song Which quickens the heart. MEN Across the fields, etc. WOMEN The orange trees in the green groves, etc. The chorus crosses the stage and goes out. Scene Santuzza and Lucia SANTUZZA entering Tell me, mother Lucia … LUCIA surprised You? What do you want? SANTUZZA Where is Turiddu? LUCIA Have you come here To look for my son? SANTUZZA I beg you to forgive me. I only want to know where I can find him. LUCIA I do not know. Don't bother me! SANTUZZA Mother Lucia, in tears I implore you, Be merciful as Our Lord was to Magdalene And tell me where Turiddu is … LUCIA He went to Francolonte For the wine. SANTUZZA No! He was seen In the village late last night. LUCIA What are you saying? He's not returned home! turning towards the door of her house Come in! SANTUZZA desperately I cannot enter your house! I have been damned! LUCIA What then do you know Of my son? SANTUZZA What a thorn I have in my heart! Scene with Alfio and Chorus Alfio, Chorus and the above ALFIO The horses' hooves thunder, The harness bells jingle, The whip cracks. Get along! Let the wind blow cold, Rain or snow fall, What care I? CHORUS O a carter's life Is a fine life, Going from place to place! ALFIO The whip cracks! At home, awaiting me, Is Lola, who loves me and comforts me And is ever true. The horses' hooves thunder, The harness bells jingle, It's Easter, and here I am! CHORUS O a carter's life, etc. ALFIO Get along! The whip cracks! Here I am! O a carter's life, etc. It's Easter, and here I am! Scene and Prayer LUCIA You are lucky, friend Alfio, To be always so gay! ALFIO Mother Lucia, Do you still have some Of that vintage wine? LUCIA I know I haven't: Turiddu has gone To get some. ALFIO But he's still here! I saw him this morning Near my house. LUCIA surprised What? SANTUZZA quickly to Lucia Hush! From the church is heard the Alleluja. ALFIO I'm going; You women go to church. exit CHORUS inside the church Regina coeli laetare. Alleluja! Quia quem meruisti portare. Alleluja! Resurrexit sicut dixit. Alleluja! SANTUZZA, LUCIA and CHORUS in the square Let us rejoice That Our Lord is not dead, And in glory Has opened the tomb! Let us rejoice That Our Lord is risen again And today is gone up Into the glory of Heaven! CHORUS inside the church Alleluja! All enter the church except Santuzza and Lucia. Romance and Scene Lucia and Santuzza LUCIA Why did you signal me To be silent? SANTUZZA O mother, you know That before he went for a soldier Turiddu had sworn Eternal faith to Lola. On his return, he found her married, And sought with a new love To quell the flame Which burned in his heart: He loved me, I loved him. But she, envious of my only delight And forgetful of her husband, Burned with jealousy … She stole him from me … And I am left disgraced; Lola and Turiddu are lovers, And I am left to weep. LUCIA Lord have mercy! What is this you've come to tell me On this holy day? SANTUZZA l am condemned! O mother, go And pray to God And pray for me too! When Turiddu comes, I will plead with him Once again. LUCIA going towards the church Holy Mary, Have mercy upon her! exit Scene Santuzza and Turiddu TURIDDU entering You here, Santuzza? SANTUZZA I was waiting here for you. TURIDDU It is Easter; Aren't you going to church? SANTUZZA I cannot. I must speak to you … TURIDDU I was looking for my mother. SANTUZZA I must speak to you … TURIDDU Not here! not here! SANTUZZA Where have you been? TURIDDU What do you mean? At Francofonte! SANTUZZA No, its not true! TURIDDU Santuzza, believe me … SANTUZZA No, do not lie; I saw you returning Down the road … And this morning at dawn You were seen Near Lola's door. TURIDDU Ha! You were spying on me! SANTUZZA No, I swear it. Alfio, her husband, Was telling us Just now. TURIDDU Is this the way you return The love I bear you? Do you want me killed? SANTUZZA Oh, do not say such things … TURIDDU Leave me then, leave me; In vain you try, With your pleas for pity, To lessen my scorn. SANTUZZA Then you love her? TURIDDU No. SANTUZZA Lola is Far more lovely. TURIDDU Be quiet, I do not love her. SANTUZZA You do love her … A curse upon her! TURIDDU Santuzza! SANTUZZA That wicked woman Stole you from me! TURIDDU Take care, Santuzza. I am not the slave Of this mad Jealousy of yours! SANTUZZA Beat me, insult me, I love you and forgive you; But my anguish Is too much to hear. Lola's Refrain Lola and the above LOLA off-stage O flower of the iris, The angels in their beauty Stand a thousandfold in Heaven, But only one there is As handsome as he. Ah! entering O flower of the iris … Oh! Turiddu … has Alfio been here? TURIDDU I've just come into the square. I do not know … LOLA Perhaps he was kept At the blacksmith's, But he can't he long. ironically And you … are you listening To the service from the square? TURIDDU Santuzza was telling me … SANTUZZA darkly I was saying that today is Easter, And the Lord sees everything! LOLA Aren't you coming to Mass? SANTUZZA Not I: only they can go Who know they are free from sin. LOLA I thank the Lord And kiss the ground. SANTUZZA ironically Oh, you're so good, Lola! TURIDDU to Lola Come, let us leave her! Why do we stay here? LOLA ironically Do stay here! SANTUZZA to Turiddu Yes, stay, oh stay, I've more to tell you! LOLA The Lord be with you; I'm going. goes into the church Duet Santuzza and Turiddu TURIDDU angrily Ah, you see? What have you said … ? SANTUZZA You wished it: then so be it. TURIDDU rushing forward Ah! By Heaven! SANTUZZA Tear me to pieces! TURIDDU turning away No! SANTUZZA holding him back Turiddu, listen! TURIDDU Go away! SANTUZZA No, no. Turiddu, Stay with me awhile. Why do you seek To fly from me? TURIDDU Why do you follow me And spy on me Without respite To the very doors of the church? SANTUZZA Your own Santuzza Weeps and pleads with you; How could you Drive her away like this? TURIDDU Go, I say. Do not plague me; Vain is your repentance After what you have done. SANTUZZA threateningly Take care! TURIDDU I do not heed your anger. He throws her to the ground and flees into the church. SANTUZZA in a fury May your Easter be cursed, you traitor! She falls, overcome with anguish. Alfio, entering, encounters Santuzza. Duet Santuzza and Alfio SANTUZZA Oh! The Lord has sent you, Good Alfio. ALFIO How far on is the Mass? SANTUZZA It's nearly over ... but listen! Lola has gone with Turiddu! ALFIO in surprise What are you saying? SANTUZZA That while you go driving In rain and wind To earn your living. Lola is adorning your head In an ugly way! ALFIO What! In Heaven's name, Santa, what are you saying? SANTUZZA The truth. Turiddu Stole my honour, And your wife Has stolen him from me! ALFIO If you're lying, I'll tear your heart out! SANTUZZA My lips are not in the habit Of uttering lies! It was the bitter truth I told you, alas, In my shame And my sorrow. ALFIO Santuzza, Then I am grateful to you. SANTUZZA I am vile To have told you this. ALFIO It is they who are vile: I will not forgive them; I will have vengeance Before the sun goes down. I will have blood, My rage shall know no bounds, And all my love Shall end in hate. exeunt Symphonic Intermezzo The people come out of church. Lucia crosses the stage and goes into her house. Scene, Chorus and Toasts Lola, Turiddu and Chorus MEN Let us go homewards, Friends, to where Our womenfolk await us! Let us hasten Without delay Now that gladness Has soothed our hearts. WOMEN Let us go homewards, Friends, to where Our husbands await us! Let us hasten Without delay Now that gladness Has soothed our hearts. The chorus goes off. TURIDDU to Lola as she goes Mistress Lola, Are you going Without a word of greeting? LOLA I must go home: I have not seen Alfio! TURIDDU Don't give it a thought; He'll be coming to the square. to the chorus Meanwhile, friends, Come, let's drink together! All come to the inn table and take winecups. Hurrah for the sparkling wine Bubbling in the glass, Bringing happiness Like a lover's smile! Hurrah for friendly wine That livens every thought And banishes melancholy In cheerful drinking! CHORUS Hurrah! TURIDDU to Lola To your love! He drinks. LOLA to Turiddu To your good fortune! She drinks. TURIDDU Drink up! CHORUS, TURIDDU and LOLA Hurrah! Drink up! Continue the tournament! CHORUS Hurrah for the sparkling wine, etc. enter Alfio Finale Alfio and the above ALFIO Greetings to you all! CHORUS Greetings, friend Alfio! TURIDDU Welcome! You must drink with us: fills a glass Here, I've filled you a glass. ALFIO rejecting it Thank you, but I cannot Accept your wine. It would turn to poison Inside me. TURIDDU throwing the wine away As you please! LOLA Alas! How will this end? SOME WOMEN to Lola Mistress Lola, This is no place for us. All the women go out, taking Lola with them. TURIDDU Have you anything else to say to me? ALFIO I? Nothing! TURIDDU Then I'm at your service. ALFIO Right away? TURIDDU Right away! Alfio and Turiddu embrace: Turiddu bites Alfio's right ear in challenge. ALFIO Friend Turiddu, You bit my ear. meaningly I am sure We understand each other! TURIDDU Friend Alfio, I know that I have wronged you; And I swear to you By Heaven above That I would cut my throat Like a dog Save that … if I do not live, Poor Santa Will be left deserted … She who gave herself to me … violently But I can plant my knife In your heart! ALFIO coldly My friend, Do as you please; I'll wait for you outside, Behind the orchard. exit Lucia and Turiddu TURIDDU Mother, That wine is strong. And in truth I've drunk Too much of it today … I must go out into the fields. But give me first Your blessing. As you did that day When I went off as a soldier… And then … mother… listen … If I should not return You must be a mother To Santuzza, Whom I promised To lead to the altar. LUCIA My son, what is this you're saying? TURIDDU Oh, nothing! It is the wine within me speaking. Pray to Heaven for me! One kiss, mother … One more kiss … farewell! He embraces her and rushes out. Lucia, Santuzza and Chorus LUCIA desperately, hurrying alter him Turiddu. What do you mean'? Turiddu! Turiddu! Ah! enter Santuzza Santuzza! SANTUZZA throwing her arms round Lucia's neck Oh mother! The scene fills with people. A confused noise is heard from the distance. A WOMAN Turiddu has been killed! They all scream.